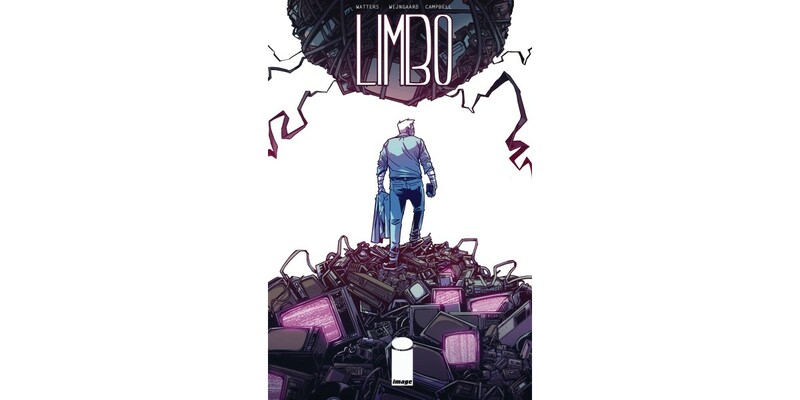 From UK creative team writer Dan Watters and artist Caspar Wijngaard comes LIMBO, a genre-bending fantasy story collected into trade paperback for the first time this May. LIMBO follows a detective with no memory, no identity, and no manners. A femme fatale seeking escape from a powerful crime lord. A voodoo queen with a penchant for mixtapes and hi-tops. A goat-eating TV... A surreal neon-noir fusing hardboiled pulp with an 80’s VHS visual aesthetic, dripping with neon and static. LIMBO (ISBN: 978-1-63215-689-1) collects the complete series, issues 1-6, and hits comic book stores on Wednesday, June 1st and bookstores on Tuesday, June 7th, and will be available for $14.99. It can be ordered by retailers from Diamond Book Distributors with Diamond code FEB160630. It can be preordered now on Amazon, Barnes & Noble, Indiebound, and Indigo.